Over the weekend I successfully used the “7th” to engrave a photo of my daughter onto a piece of wood. Turned out very well. This was just a test cut, so I just used some scrap hardwood plywood. I’ll do it again on real wood later. I used a carbide v-bit as the cutter and attached the plywood to the y-axis table with double-sided tape (after cutting through a clamp with the cutter on an earlier attempt!). This engraving used the raster-to-vector method. Essentially converting certain highlights and edges on the photo to vectors using various freeware and shareware software routines. I took a digital photo of my daughter and loaded it into WinTopo (the freeware addition). In Wintopo I converted the raster photo to vector and then eliminated a lot of the “noise” vectors that were created to get a fairly clean drawing. I then saved the vectors out of WinTopo as a DXF file. I then used Acer (freeware DXF to g-code converter) to convert the DXF file to g-code. I set the maximum z-axis cut to 0.1 inches in depth. The g-code was then loaded into the my CNC machine’s PC and I used TurboCNC (shareware CNC controller software) to run the machine. The CNC machine took about 1 hour and 45 minutes to cut the picture (engraving is about 13″ x 9″). I ran the machine slowly about about 6 ipm for this test run. Everything worked beautifully. I rubbed a cherry stain over the finished piece to darken the engraving marks. For my next photo-engraving experiment I want to try the depth-of-cut shading type (I don’t know what to call this method) engraving. This method leaves the photo as raster and engraves deeper for darker pixels and more shallow for lighter ones. I am using shareware called IMGTOGCODE for this attempt. These engravings take much longer for the machine to carve, so I will do I much smaller image. Posted on November 21, 2005, in CNC. Bookmark the permalink. 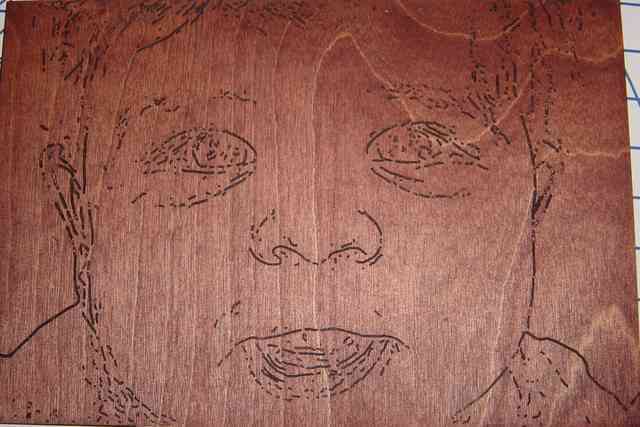 Comments Off on Vector Photo Engraving on the CNC – test #1.